Essays From The Soul is available, either in a paperback or in a Kindle version, for purchase at amazon.com. Ordained minister Arthur M. Scott considers himself a lifelong student with an insatiable hunger for learning. He and his wife, Pati, have been facilitating discussion groups on spiritual books for the last 15 years. But it wasn't until last year that Scott set out to release a book of his own. Essays from the Soul is a collection of essays Scott began writing while hosting a bimonthly study group on Helen Schucman's A Course in Miracles. The essays simply started as a study tool for Scott, long-form notes of comparison he would take between the book and other spiritual texts he'd read, including Ernest Holmes' The Science of Mind and Elaine Pagels' The Gnostic Gospels. SPIRITED AWAY Arthur M. Scott compiled more than 50 of his spiritual essays into a book, Essays from the Soul. From there, the essays became more than just comparison and took on a new purpose: to explore Scott's own perception of metaphysics. Rather than try to promote one indisputably "right" answer to certain spiritual questions, Scott only intends that the essays present explanations that have resonated with him personally, incorporating various religions and teachings. New Times: What can readers of Essays from the Soul expect to find? How would you describe the book in your own words? 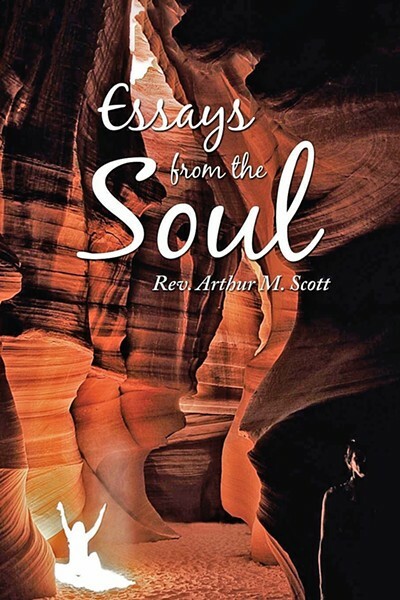 Arthur M. Scott: Essays from the Soul is a compilation of information I have gathered, which was inspired by my love/obsession with research I do in order to help me better understand the science of spirituality, strengthen my spiritual comprehension, and also to answer questions I've been asked by others or I ask myself. NT: Before writing these specific essays, how would you describe your writing experience? Have you always been into writing? AMS: I did not begin writing until I was in my 60s. It simply never crossed my mind that I could. I was a math major. I thoroughly enjoy writing now, because it allows me, at my pace, to put my thoughts together and edit them before anyone hears or reads them. NT: I understand the essays began as a form of taking notes while studying A Course in Miracles, which you continued to do while reading other spiritual books and taking seminars? AMS: The essays began as bits and pieces of ideas I wrote down, or quotes I enjoy, with some personal experiences added in. The notes became sentences, the sentences became paragraphs, and the paragraphs became essays. This process went on for several years. NT: When did you realize these essays could possibly be compiled into a book of your own? AMS: They were originally planned for my benefit only, research and education. I read one to my wife—she's always been very honest with me—and she liked it. She edited, but she liked it. I have read every one to her since. One day my wife asked me how many essays I had. Not knowing, I took the time to search the house and the office and began gathering them together. I found more than 80 of them and used 60 of them for this book. NT: Any plans for a follow-up to include the remaining 20? As well as new essays? Calendar Editor Caleb Wiseblood writes articles from the soul. He can be reached at cwiseblood@newtimesslo.com.